Northampton based Looking Glass Theatre will be celebrating 10 years on tour with pantomime and will be visiting more than 50 venues across the county. 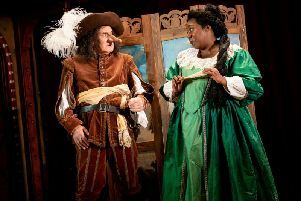 The company will stage Robin Hood and Babes in the Wood, with the tour starting today (Thursday) and running through until Monday, January 9. Come and join the merry men and their quest to defeat the villainous Sheriff of Nottingham. Will Maid Marion find the man of her dreams and will Robin Hood win the archery competition, defeat the evil wizard of the Greenwood and save Jack and Jill? The tour will take in venues at Brigstock and Lilbourne Village Halls on Saturday, December 3. People can also see the show at St Peter’s Church in Marefair, Northampton, on Saturday, December 31, at 2pm and Monday, January 2, at 2.30pm. Tickets for these shows are £10 for adults, £8 for concessions. To book, or for more details on the tour, visit www.lookingglasstheatre.co.uk or call 01604 472029.